Want to know if your Nexus or Google Pixel is running with the latest software? Or do you want to install the next Android update on your Nexus all by yourself? We've compiled all useful resources and flash instructions that you need to update your Nexus smartphone/tablet or Pixel phone. The monthly Android update for November has arrived, bringing a fix to the KRACK vulnerability for all Pixel and Nexus devices. Plus, it also addresses the clicking noises and screen burn-in problems users have had with their Pixel 2 and Pixel 2 XL phones. The monthly Android security patch is here, this time with the 2017-11-06 designation and a bunch of stability and security improvements. Most notably, this update fixes the critical KRACK WPA2 Wi-Fi vulnerability discovered a few weeks ago. This patch is arriving via OTA on Pixel and Nexus devices now, and will hit them all by next week. The aforementioned November update has some nice surprises up its sleeve specifically for the new Pixel 2 and Pixel 2 XL smartphones. Both devices will be receiving the previously announced Saturated color mode. Plus, two important problems have been addressed. The clicking noise some users complained of in the Pixel 2 has been solved. And, some UI changes have been implemented to help avoid screen burn-in, which some have already begun to notice on their Pixel 2 XL units. These UI changes include a 'fade out' of the navigation buttons and an update to the maximum brightness of the OLED screen. We will have to wait and see if these changes are sufficient to prevent burn-in. Google has posted their update plans for the Pixel and Pixel XL devices on an official support page. These two phones were launched in October 2016, and have now been guaranteed Android version updates through to October 2018, and security updates until October 2019. This sort of timeline isn't unexpected, as it has been mostly the same with Nexus phones: two years of Android updates and three years of security updates guaranteed. That said, by adding this information to the support page, it's now officially locked in. In recent days there have been reports that the Nexus Player and Pixel C have been receiving an Android 7.1.2 update. If you need a heads-up on the 7.1.2 update, it's not a major event as it brings with it only a few notable new features. For instance, the Pixel Launcher has managed to make its way to the Pixel C and includes a new battery usage list. For the moment, the Google OTA and Factory Image pages haven't been updated. Whilst the latest update has only been rolled out to the Nexus Player and Pixel C, this is a sign that other devices will be receiving the Android 7.1.2 update relatively soon. The Nexus 6 had already received an update to Android 7.1.1 Nougat, but Google has now decided to downgrade the smartphone back to Android 7.0 Nougat. This choice was likely due to bugs, but the downgrade OTA is causing even more problems. Nexus 6 users just can't catch a break. The update to 7.1.1 brought bugs, but those were fixed in the March security update. The March security update, however, then broke Android Pay. And now, users with 7.1.1 are reporting that they are receiving OTA updates to... Android 7.0. It should come as no surprise, this unusual downgrade has some problems. Once the 7.0 OTA is downloaded, users are reporting that apps are continuously crashing after the update. A Nexus Community Manager posted on Reddit that a factory reset should solve any issues. The Community Manager also clarified that users will need to "get back on the 7.0 supported track" to guarantee future OTA updates. But, users who want to flash or sideload future builds are welcome to stay on 7.1.1. As a Nexus owner, you're in the privileged position of being able to receiving a monthly security update from Google. Your smartphone automatically checks whether there is a new Android version every day. However, these updates are not released to all users at the same time. You can try to trigger them manually if you go into Settings > About Phone > System Updates - though this won't do you much good if the update hasn't been released for your smartphone yet. Nexus devices will receive security patches for at least three years from their initial availability, or at least 18 months from the last availability on the Google Store, whichever is longer. If your device is still in the list to receive an Android update, it's worthwhile taking a look at the so called Factory Images. These will give you an indication about which Android version is the most up to date for your Nexus. If you want to go down this road, you need to accept the terms of service - which will warn you that you might end up loosing your data as a consequence. Then tap on the name of your device to get to the list with the current firmware. You'll be able to tell the difference between the various versions by their build number. Compare the build number with the one on your Nexus. This is easily done by going into Settings > About Phone. If your smartphone has a different version from the one listed, you'll most likely receive an Android update relatively soon. If you want to receive the update earlier, there is the option to install it manually. We've sorted the various options of installing updates on Pixel and Nexus devices from the most simple through to the more complicated options. 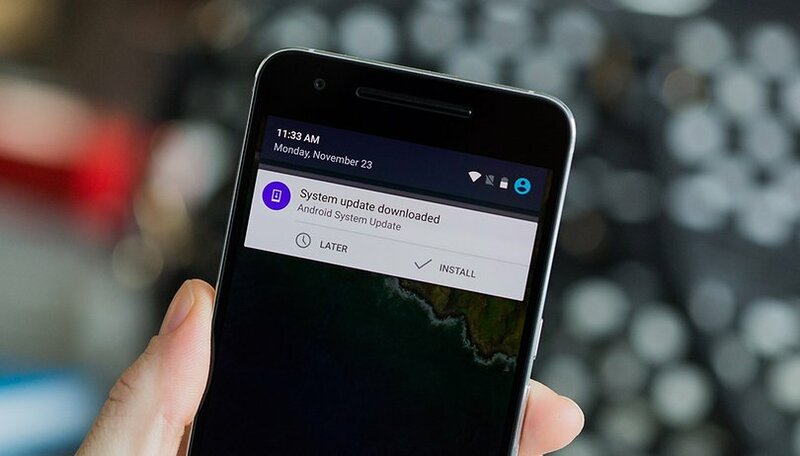 Further down below are some solutions on how to get Android updates for devices that are no longer receiving official updates. Google is the only smartphone manufacturer to publicly publish its update plans in such an orderly form. Google always distributes its updates "Over the Air", but you'll often have to wait several weeks before you'll actually receive them. Google also offers the OTA files on their official download page, so you can easily flash them yourself. The advantage of updating your device like this is that no factory reset is required. You still need ADB tools for this method though. The prerequisite for this method however is that you have not modified your device. If you are using Xposed, have a custom kernel, custom recovery, SuperSU, or even installed a custom ROM, you wont be able to flash the OTA file. You can find the OTA downloads on Google's developer page. Use the volume buttons to select Recovery Mode and press the Power button. Once you see the Android robot, hold down the Power button and briefly press the Volume Up button. From the open recovery menu, select the apply update from ADB option with the volume buttons and confirm your selection with the power button. Connect your Nexus to your computer using the USB cable and go to the ADB Tools folder. Hold down the Shift key on your keyboard and right-click on an empty spot in the Explorer and select Open Command Window Here from the context menu by clicking on it with the left mouse button. Now enter the following command and confirm with ENTER: adb sideload <filename> - ota.zip. The update will now be installed. The entire process takes about 5 minutes. When everything is ready, you can restart the Nexus using the reboot system option in the recovery menu. Tip for the command line: Just type the first characters of a file name or command and press the Tab key to complete it automatically. Probably the most elaborate, but also reliable, way to install a new Android version on a Nexus is via the Factory Image. After this process your Nexus will have reverted back to the factory settings and all your data will have been erased. Back up your photos, address book, SMS, and call history before you opt to update your Nexus like this. You will also have to reconfigure your apps afterwards. After setting up USB Debugging, download the above mentioned Factory Image for your Nexus. At the same time you can already start backing up your phone and unlocking your bootloader (here's a tutorial on how to do it for the Nexus 5). Note: For older Nexus devices, the flash command is not called fastboot flashing unlock but OEM unlocking. Opens the download folder of the Factory Image and unpack the file [device-name] - [build-number] - factory - [code] .tgz (or similar) with a package program like 7-Zip. Open the unzipped folder and unpack the file [device name] - [build-number] - factory - [code] .tar. Move the contents of the folder [device-number] folder to the ADB Platform Tools folder, and double-click the flash-all.bat file. The factory image will now be installed on your Nexus. This will take a few minutes, but once it is finished press any key on the keyboard to close the input prompt. The Nexus will end the installation and then restart. Thanks to the Android Beta Program, you'll be able to get your hands on future Android versions before their actual release. You can register your devices for the beta program via this link. Google lists authorized devices on the same page. Shortly after registering you'll receive an OTA update to the current beta version. Caution: Updates may contain errors that may affect the normal performance of your device. After the end of the program, your device will be updated to the regular release. If you want to revert back to a stable version before the regular release, all user data on your device will be deleted. An alternative to the beta program is to just download the factory images of the preview versions and flash them. You'll find the current Beta version 7.1.2 here. Unofficial Android Nougat updates for Nexus 5 and Co.
Has your Nexus passed the "Google update expiry date"? Do you still want new features and updates? The Android community offers numerous unofficial updates, which you can flash on your Nexus with minimal risk (this does not mean risk free). This will always result in data loss, which is why you should make a backup. If the process goes wrong, you bring your Nexus back to life again with the factory images. Officially Google may not be develop a Nougat update for the Nexus 5, but that does not mean that the smartphone has been left for dead. Since its last official update, several Custom-ROMs have become available. The supply of Nougat-based firmware for old Nexus devices is still growing. In most cases, it is still better to wait though until truly stable versions have hit the developer forums. Lineage OS is ready for more and more devices and the development of the other custom ROMs based on Nougat is almost complete. Have you installed an Android update on your own Nexus device? Was it successful? Let us know in the comments below. I have a Nexus One phone running Android 2.3.6 Is there a problem on jumping all the way up to 8.1.0 ? This is a great little pocket size phone that should not be in my desk drawer. Any ideas ? I have a Nexus 5X running fine with Android 7.1.2 (and its not a beta) that has got it from OTA. And I can attend the beta program for Android O (8) if I want. What have you been smoking. That diagram is for me just confusing or maybee wrong. I'm running Nougat 7.1.1 with March 2017 Security Update withOUT any problems on NEXUS 6 and NEXUS 9 LTE tablet. You must have an UNrooted and Locked OEM in order for Android Pay to work. Otherwise, it won't cooperate. Will keep y'all posted if any issues crop up. Wow this doesn't sound right to me. How do you fix bugs by downgrading causing more bugs and problems than what users initially had? Why not just fix the issues that was reported on 7.1.1? At some point they will anyway receive 7.1.1 again. Why the back and forth move with the firmware? Feel sorry for the effected Nexus users. Receiving new features with the 7.1.1 update I assume and I guess they will lose it reverting back to 7.0. Why don't nexus devices get longer OS support? only 2 years? My wife has a nexus 5x (running Nougat) which is actually pretty awesome, and i still have my old HTC One M7 (running Lollipop) which has been showing it's age. OS updates is an ongoing bugbear with Android, as we also have an Apple iPad4 (2013) still running the lastest OS 4 years on. Honestly, why can't Google change this so the OS with security updates directly updated from google (ie. nexus/pixel and apple) and then manufacturers push out their UI (ie. Sense, Touchwiz etc.) overlays all as "app" updates over top - is it too late/ingrained as is or is this just too hard to change? Hey Greg - there are several reasons for this. Google only "guarantees" an update cycle of 2 years for nexus devices and cites the hardware as the reason. Its more like an insurance policy, as older devices (hardware) might not be able to cope with the increased demands of a newer OS. The reality is though that while some older Nexus devices wont receive newer versions OTA, they can still run them perfectly fine if you install them manually. Even if you dont get a new android version, you still receive the security updates for a certain time - but thats more of a consolation prize. Apples policy is different with updates as they have 100% percent control of all hardware aspects - google never actually built any nexus devices -> the pixel isnt a nexus. Thanks Georg, i just don't think 2 years is good enough really, surely the OS can run on older hardware, I mean next year the hardware of the HTC 10 (4gb ram with SD820) is not powerful enough for the 'official' OS? that's a bit on the nose, it seems counterintuitive given how few devices really run the latest version of android and given how slow OEM's are updating their skins and OS. Sadly the 2013 Nexus 7 reached EOL in August 2016, but you install Lineage OS 14.1 to get Android 7.1.1 on this tablet. It works well.